Fifty years ago today Sputnik was launched. I was a high school sophomore living in Nebraska. I remember standing out in the road that night with my parents and brother watching it slide overhead; a star that moved! 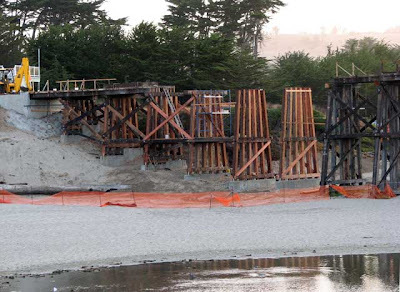 Our "over one hundred year old" Pudding Creek Trestle bridge now has all the new "uprights" in place! As you may recall, I sent a letter April 11 asking you to help “Save Our Horse-and-Buggy Rings”. The City Council and Staff, especially Dave Goble, were very helpful about finding a way to preserve the rings. As part of that experience, I received assurances the city was committed to protecting the remaining features of historical significance. I’m writing today because there may be a similar situation developing; it seems the last two square redwood power poles have new construction markings which are worrisome. 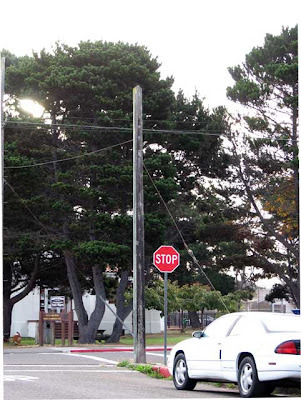 Ron Bloomquist, my friend who documents Fort Bragg discoveries on his Walking Fort Bragg blog, just called to say he noticed markings on the sidewalk around both poles. We aren’t certain what the markings mean, hopefully nothing we need to be concerned about. However, if the markings signal the pending replacement of the poles, we hope you’ll find a way to preserve rather than replace them. I’ll be calling Dave soon, but wanted to alert you all, in case Dave is unavailable. Thanks again for helping preserve Fort Bragg’s special character." I am leaving town for four days. I hope the pole is still there when I get back. Ron, have you seen a movie called October Sky? Just saw it the other day - wondered if the way it shows Sputnik racing across the sky is the way it really looked. Hi Suzanne44. October 14th I rented and watched October Sky. An excellent film and yes, that is exactly the way I remember seeing Sputnik pass over Eastern Nebraska back then. Thanks for the movie suggestion.